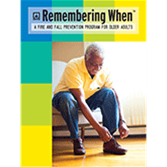 "Remembering When™: A Fire and Fall Prevention Program for Older Adults", was developed by NFPA, and contains everything you will need to conduct a comprehensive fire and fall prevention program for older adults in your community. Adults age 65 and older make up about 12 percent of the population in the U.S. and Canada. The need exists. 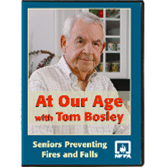 Compared with the general population, older adults are twice as likely to be killed or injured by fires or falls. Each year, 30 percent of individuals age 65 and older are involved in falls, the leading cause of death from unintentional injury in that age group. Use local television, radio and newspapers as well as posters, fliers, websites, blogs, Facebook, Twitter to advertise your open house. Send out news releases. Invite older adults, their family members, friends, and caregivers. Be sure to include information regarding prize drawings and refreshments. Set up learning stations based on seniors’ needs that provide a variety of information that they can use immediately in their daily lives. Provide cards listing the learning stations in blocks (similar to a bingo card) and an area for the participant’s name and telephone number. Participants get their cards stamped at each station they visit. Encourage participants to ask questions and interact at the learning stations, not simply stop and get their cards stamped. Participants who get a stamp from every station submit their cards for a prize drawing. Prizes: Nightlights, grasping devices, lid opening devices, oven mitts, portable timers, smoke alarms, carbon monoxide detectors, gift certificates to local restaurants or hardware stores. Partner with local grocery stores or markets to donate refreshments or ask local service organizations to sponsor the refreshments. Use signs to advertise contributions (“Refreshments courtesy of Main Street Market”). Provide clearly marked restroom facilities and seating areas for resting and enjoying refreshments. Make sure all areas and facilities are accessible for people with disabilities. Greeters welcome participants, give each a bag for handouts and a passport card, and explain the passport card system. Materials: Rugs, nightlights, shoes, grab bars, and grasp devices, and educational handouts, such as The National Institute on Health’s Exercise Guide; listing of community physical fitness activities for seniors; business cards; list of upcoming Remembering When presentations. Presentation: Falls are the leading cause of unintentional death in the home. Thirty percent of adults age 65 and older are involved in falls each year. Throw rugs can cause tripping and falls: it’s better not to use throw rugs at all, but if you must, use low-pile, nonskid rugs. Rug liners are not recommended since they can actually make rugs worse. Regular eye checkups and proper lighting can help prevent falls. Several types of nightlights are available: regular, light sensor, touch activated, sound activated, clap on/clap off. Sturdy shoes can support the foot/ankle and help prevent tripping and falls. Wearing slippers or socks/stockings without shoes in the home can cause the foot and ankle to become weak and result in slips and falls. Grab bars can help prevent slipping and falls. Grasp devices assist in retrieving items from high shelves and cupboards and prevent falls. Physical fitness can help with muscle strength and stability (demonstrate balance exercises from the National Institute of Health Exercise Guide). Materials: Two chairs, small table, blood pressure cuff, stethoscope, informational handouts; partition, taped off area, or separate room if privacy is a concern. Presentation: High blood pressure (HBP) is the “Silent Killer,” usually with no signs or symptoms. One in three adults has HBP, (approximately 74.5 million U.S. adults). Uncontrolled, HBP increases your risk of heart attack, stroke, and other health problems. Easily detected through blood pressure checks at routine doctor’s visits, there is no identifiable cause for high blood pressure in most adults. Risk factors include aging, family history, being overweight, lack of physical activity, diet, and tobacco and alcohol use. Encourage participants to have their blood pressure checked at the station. Materials: Kitchen area or stovetop display, pan, lid, kitchen towel, timer, large spoon, oven mitt, bath robe, button-down sweater or front-zippered sweater or jacket, cooking safety tip sheet. Presentation: Cooking fires are the #1 cause of home fires, usually due to unattended cooking. When you are cooking, do not wear loose-fitting clothing; roll up sleeves, zip jackets, and button sweaters. (Put on bathrobe and demonstrate how wide sleeves can brush stove burner. Put on button-down sweater- and demonstrate how the corners of a sweater can brush a burner when you are reaching to the back of the stove.) When baking or simmering foods, set the stove timer; if you are leaving the kitchen, take a portable timer with you. If you need to answer the telephone or the door, turn the stove or oven off or place an over mitt on your hand or carry a large spoon in your hand to remind you of the cooking food Never leave frying or broiling food unattended — if you must leave the area, turn the stove or oven off. Turn the handles of pots and pans to the side so you don’t accidentally bump them and spill the contents. A small pan fire can be extinguished by sliding a lid onto the pan and turning the stove off. Leave the pan covered until it is completely cool. (Demonstrate.) Keep towels, dish clothes, and other flammable items away from stove. Presentation: Everyone should have an escape plan and practice it at least twice each year with everyone in home. Visitors, such as children and grandchildren, should know the plan. There should be two ways out of every room in the home: usually the door and a window. Smoke is hot and toxic, so you should get low, below the smoke. If you are unable to escape, go to a window. A light-colored t-shirt, pillowcase, or flashlight can be used at a window to let firefighters know you need to be rescued. If you can get outside, go to your meeting place and call 9-1-1. Examples of meeting places are a tree, light pole, or a mailbox.Never go back inside for anything or anyone—it’s the firefighters’ job to rescue trapped individuals, and it’s your job to let the firefighters know if someone is trapped inside. See information about mid- and high-rise escape planning and planning for people with disabilities. Presentation: Stop, Drop, and Roll is used when your clothing catches fire. Fire spreads rapidly, so it’s important not to run or even walk if your clothes have caught fire.Demonstrate step-by-step Stop, Drop, and Roll procedure. If you cannot stop, drop and roll, keep a blanket or towel nearby to help you or others smother flames. Cover the person with a blanket to smother the fire. If you use a wheelchair, scooter or other device and are able to get to the floor, lock the device first to stay in place before getting on the floor to roll until the flames are out. Use cool water to treat the burn immediately for 3 to 5 minutes. Cover with a clean, dry cloth. Get medical help right away by calling 9-1-1- or the fire department. Important note for station personnel: You should demonstrate the stop, drop, and roll technique but don’t have older adults practice it at your learning station. Some older adults could hurt themselves if they are not in good physical condition. Tell them to use the technique only if they are actually on fire. Presentation: Almost two-thirds of home fire deaths result from fires in homes with no smoke alarms or with smoke alarms that don’t work. When there is a fire, smoke spreads fast and you need smoke alarms to give you time to get out. Smoke alarms should be installed on each level of your home, including the basement, inside each bedroom, and in the hallway outside the sleeping areas. Smoke alarms should be tested at least once each month. (Demonstrate how to test a smoke alarm.) For the best protection, interconnect all smoke alarms so that when one sounds, they all sound. Replace the batteries in your smoke alarms at least once each year. If a smoke alarm chirps, the battery is low—replace the battery right away. Although smoke alarms have a 10-year life span, they need to be replaced sooner if they are not responding properly. Special smoke alarms are available with features such as “hush” buttons and the ability to be tested with a remote control. For people who are deaf. Smoke alarms and accessories are available for people who are deaf. Strobe lights throughout the home are activated by smoke alarms. In bedrooms, a high-intensity strobe light is required, along with a pillow or bed shaker. In some cases, this equipment is activated by the sound of the smoke alarm. People who are hard of hearing. Smoke alarm accessories are available for people who are hard of hearing. These accessories produce a loud, mixed low-pitched sound. This equipment is activated by the sound of the smoke alarm and is usually installed next to the bed. Smoke alarm accessories such as bed/pillow shakers, transmitters, and receivers are available at www.lifetonesafety.com and www.safeawake.com. Recent research has shown that a loud, mixed low-pitched sound is more effective for waking people of all ages than the loud high-pitched sound of a traditional smoke alarm. As people age, their ability to hear high-pitched sounds decreases. Choose products that have the label of a recognized testing laboratory. Research the available products and select one that best meets your needs. Purchasing Alarms. Smoke alarms with built-in or separate strobe lights can be purchased through home improvement store websites or by searching the internet for “strobe light smoke alarms.” BRK/First Alert, Gentex, and Kidde brands offer this type of smoke alarm. Make sure any smoke alarm or accessory device you use has the label of a recognized testing laboratory. Allow partners to host or provide a station for the event: senior meals program, senior center, senior transport services, in-home health care providers, health department services. Working together with partners to provide a wide array of information and services results in the greatest benefit for event participants and nurtures relationships with the partnering organizations.